Check this out! : The original motion picture soundtrack for the movie “Salami Aleikum” (2009), directed and co-written by Ali Samadi Ahadi, is now available on all major streaming platforms (spotify, apple music, itunes, tidal, amazon, etc…). It includes my score and source music, as well as all the songs written exclusively for the movie, and produced and arranged by me. Featuring performances by Mohammad Reza Mortazavi, Falk Breitkreuz, Roman Bunka, Michael Weilacher, Stefan Weyrer, Karin Schmeer, Alex Hötzinger - and vocalists: Navid & Omid, Nooshin, Christin and Alex Abedi. My original score for the German TV movie "The Case of Jakob Von Metzler" (directed by Stephan Wagner) is now available on Spotify and Apple Music. It features 12 dark ambient, electronic soundscapes. Check it out and let it stréäm....! ...coming on March 1, 2019: "The Case of Jakob Von Metzler"
Within the next months we will release some of my filmmusic scores which I composed and produced in the past few years. These will be streaming and download releases only since CD sales have significantly decreased, and it is hard to finance smaller editions. The featured scores will include „Tehran Taboo“, „The Case of Jakob Von Metzler“, „Salami Aleikum“, „Turkish For Beginners“, and others. My score for the German feature film “Offroad” (2012) is now available on all streaming platforms, like Spotify, Apple Music, Tidal, Amazon, etc. and also as download on iTunes, Amazon and of course still on Bandcamp (which btw. is still my prefered platform. If you want to help us artists, buy and listen to our music there). The movie was directed by Elmar Fischer, main actors were Nora Tschirner ans Elyas M’Barek. If you dig experimental, ambient electronica you might enjoy this release which is now available on all the main streaming services like Spotify, iTunes, Amazon, Bandcamp, etc. I am currently working on my last cues for the score of the German series „Dogs Of Berlin“ which is coming to Netflix in December - Check it öut! Currently in the works: "Dogs of Berlin" for Netflix.... coming on December 6th, 2018. A little impression from today's rehearsal with the fantastic Münchener Kammerorchester, and their dynamite conductor Clemens Schuldt. Featuring the great actor Udo Wachtveitl. For those of you non-germish friends: 'Peterchens Mondfahrt' (Little Peter's trip to the moon,) is a classic German children's book. For this new version I rewrote the text and composed music for a large string ensemble. 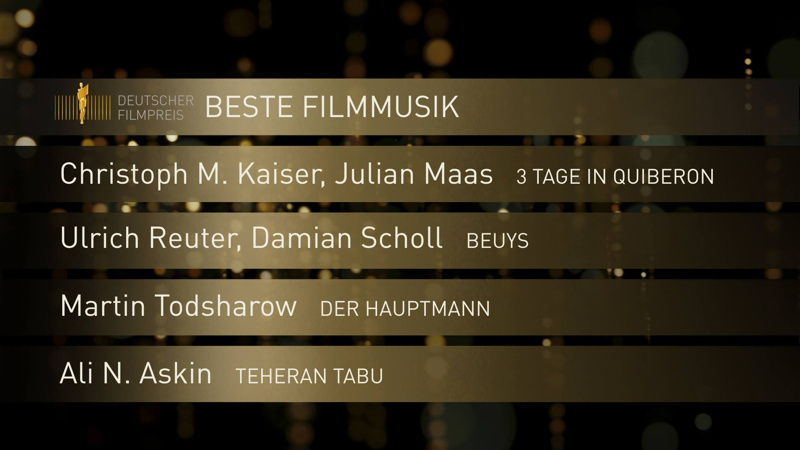 My score for the feature film "Tehran Taboo" was nominated for best film score.... ! Tehran Taboo in the U.S.
"Tehran Taboo" the movie by director Ali Soozandeh, with the score of Ali N. Askin, has hit US American movie theatres. Here is a brief review by the New Times.